The most popular fiber optic connectors over the years (e.g. ST, FC, SC, LC) have used a cylindrical ferrule to hold and align the fiber and have an mating adapter to align two identical connectors for mating. A securing device like a screw-on nut, bayonet latch or snap-in latch completes the design. This describes the majority of fiber optic connectors that have become widely accepted, like the SMA, ST, SC and the new small LC. All these connectors are easy to test. The protruding ferrule makes it simple to connect them to test equipment as well as each other. Testing loss was a two-step process: use a power meter to measure the power out of a reference cable with that style of connector on the end to establish the power launched into the connector being tested (one cable reference above), then attach the connector to test to that reference cable and measure the power transmitted through the mated pair of connectors and the rest of the cable. If you were testing a short patch cord using FOTP-171, this test only tested the connector mated to the reference connector, as a short length of fiber adds negligible loss. That’s just what you want, as you could test each connector separately and confirm it was good. Since it tests only one end of the cable, we called it the “single-ended” test. If you wanted to test an installed cable plant, you included a second cable at the power meter end, so you added the loss of the connector on that end of the cable to your measurement, as well as everything in between. We called this a “double-ended” test per OFSTP-14. But what happens if your connector is not compatible with your power meter and you can’t mate the launch reference connector to your power meter to set the reference? Or even worse, if the connectors are a plug and socket or gendered design like the the MPO and can only mate with their oppisite counterparts? They have jacks on each end of the installed cable plant you want to test and use patchcords with plugs on either end. MPO connectors have either pins or holes for mating alignment. The wall jack connector has pins. 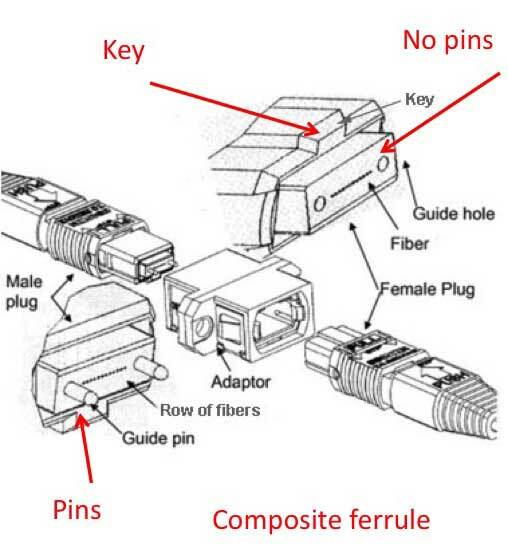 In the earliest days of fiber optics, resourceful engineers devised several ways to work around these issues by using hybrid fiber optic cables, a cable with one type of connector on one end and a different type on the other end or for connectors that shared the widely-used 2.5mm ferrule, hybrid mating adapters. You must choose reference cables with connectors that mate to your test equipment on one end and the connectors on the cables you want to test on the other end. Then you can connect your cable to test in the middle to make the measurement just like other double-ended tests. Table 1. Reference methods for fiber optic loss testing. Here is a complete rundown on all standard methods of testing fiber optic cables. Here are the FOA Standards for testing fiber optic cables. If you set your 0 dB loss reference with just the launch cable (1-cable Method), you set the reference at the output level of the launch cable, so any losses associated to cables under test – the mated connectors and any losses in the cable or cable plant itself – are included in the loss measured by the power meter. 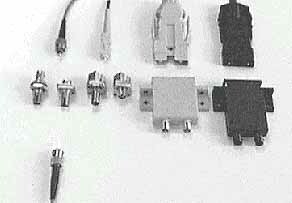 If you set your reference with two cables, launch and receive (2-cable Method), one connector loss – the loss of the mated connectors on the reference cables – is included in the reference. When you make a measurement of a cable you want tested, the measured loss will be lower by this connector loss, which is not really known. It could be as little as 0.2 dB or as much as 0.75 dB in the worst case. Our lab tests have shown the error of the measurement is higher also, by as much as +/-0.25 dB, due to the unknown connector loss included in the reference. There is usually only one practical solution for the plug and jack type of connector. The 3-cable Method uses launch and receive cables, plus a known good cable configured like the cable you want to test between them. It should be of known good quality but only a short length of fiber, to have minimal loss. If you use the 3 cable reference to set the 0dB reference, you include two unknown connectors, reducing all measurements by these connectors’ losses, from 0.4 to 1.5 dB, and the uncertainty can be over +/-0.25 dB. Setting the 0dB reference power is not a trivial issue. US and international standards allow setting the “0 dB” loss reference with either one, two or three cables, as long as you document the method in your test results. The TIA-568 structured cabling standard says you should preferably use the 1-cable Method, but others are acceptable. The equivalent international standard (IEC/ISO 11801) says you should use the three cable method, as it is the only method that works with any style of connector. Communications network standards are no better, as they have used all three methods in their documents to define what cable plant loss is acceptable for their network. Is there a solution? We recommend choosing the simplest method that works. (Table 2) For the usual 2.5 mm ferrule ST and SC, use the 1 cable Method reference and for the plug and jack duplex connectors like the MPO, use the 3 cable Method reference. But do keep your reference cables in good condition, clean them between measurements and document your methods for your customers. Sometimes the method used is less important than consistent test methods, as bad fibers and cables should stand out from the good ones no matter what the test method. Method A can be used if the connector under test can be adapted to the connector interface on the test set – e.g. 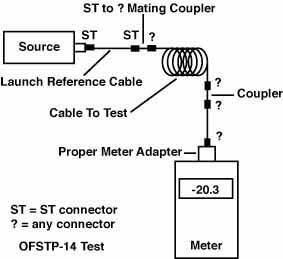 a tester with SC interface, but ST and FC can be mated to SC with a hybrid mating adapter, so SC reference cables can be used.